"Delusions of Grandeur," an original satirical comedy with a dash of experimental production, began as a small group of friends who were producing parodies at KBVR. It became a popular, award-winning public access TV show. Adam Winston, program director and producer of "Delusions," felt that he needed a format to bring together the shorts and skits that were being made. So the idea of "Delusions" was born. Winston became the host of the show, which has been running for the last three years and has won several regional film festival awards. Part of the success of "Delusions," Winston said, is attendance. Getting enough people to show up on time makes all the difference, he said. "No experience is needed for any of the positions," he said. Experience also has a lot to do with the show's success, since Winston has been producing the comedy for three years and now works with a staff of 20 to 25 people. Winston is currently working on a "Star Wars" parody, "Jedi 5," which will air at 8 p.m. on Feb. 15. Also featured on the show are videos and programs submitted by record companies and students in other areas. Case Bowman, station manager at KBVR, would like to recruit more students to both the news show and the station in general, but would like for them to be there to enjoy themselves. If they're not having fun, he said, they're less likely to participate. Students come to KBVR to gain experience in broadcasting, but the public access channel and its equipment are available for anyone attending OSU, not just broadcasting students. "We encourage any student who wants to get involved to come in," said Casey Campbell, producer and communications major at KBVR. 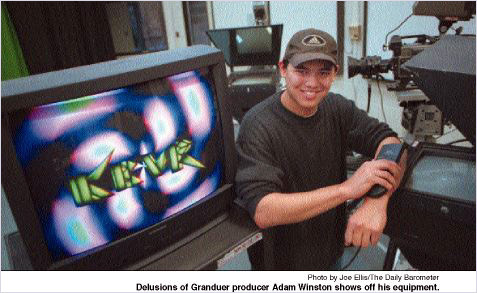 "It's a resource for students to produce TV programming," Winston said. Interested students are only required to take a class in either videography or production techniques. That way they get an idea of how to use the camera equipment and learn techniques for editing and lighting. From there, students submit a production proposal that outlines what their show will be about, who will be working on it and about how long the program will be. Although there are five cameras that can be checked out for the productions, the staff at KBVR encourage the would-be producers to use the studio and equipment for their videos and programs. Students have access to linear and non-linear editing systems. Linear is the more traditional form of editing, which utilizes two VCRs to put together a piece of film. Non-linear is a computer-based program with a digital format that allows for more special effects. "We have a lot of people here to help you out," said Case Bowman, station manager for KBVR. And there is a lot of freedom on what can be shown on public access after 10 p.m.
"Eskaton" is an alternative music video show. Even though the show is no longer in production, it has gained quite a following and is still shown in reruns. Most of what is broadcast at the station is produced at OSU. The programming is paid for with $79,652 from student fees. Money left over at the end of the year is placed into a reserve account to be used for items needed by the TV station. The reserve account pays for equipment such as new lighting equipment and monitors needed for the $60,000 worth of computer equipment donated by Sony last summer.